The Handpresso Pump is the first ever espresso maker as such. Handpresso launched the machine and the concept in January 2008. The idea was to be able to drink a real espresso even in the middle of nowhere. Handpresso Pump is intended for those who wish to use ground espresso coffee or standard espresso pods. What does the whole Handpresso Pump set include ? The nice bag contains the portable espresso maker in black, silver or white as well as the Handpresso thermos flask with integrated thermometer in the same colors. There are also 4 unbreakable cups to allow you to share this espresso moment with friends, wherever you are and make this coffee break unforgettable. 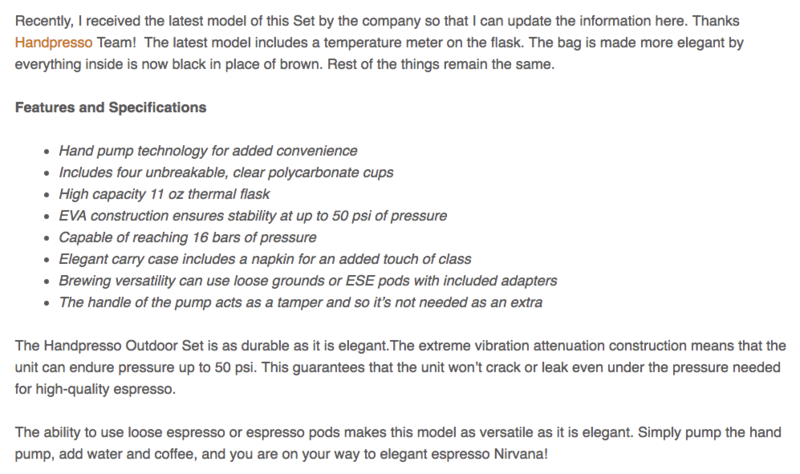 With the manual coffee maker, "you are close to elegant espresso Nirvana!" Amit writes: "the Handpresso Outdoor set s as durable as it is elegant. the extreme vibration attenuation construction means that the unit can endure pressure up to 50 psi.... The ability to use loose espresso or espresso pods makes this model as versatile as it is elegant.